In the world of Chinese percussion, Chinese gongs are significantly indispensable. Typically cast from bronze and shaped like plates, the use of these instruments can be traced back to the Northern Wei (6th century) period. Gongs are extremely complex - more so than other Chinese percussion instruments - as they come in different shapes, makes and names. Till today, it is not possible to list all the various Chinese gongs used in China. Amongst all of them, two of the most important gong families are the jingdaluo gongs and the daluo gongs. The former have a diameter of about 30 cm and a playing surface area of about five cm; they have a smaller surface and thus a higher pitch. On the other hand, the daluo gongs have a diameter of about 35 cm and a playing surface area of about 10-12 cm, and produce relatively dark tones. Some of the Chinese gongs that can be found in the Chinese orchestra include: the big gong, small gong, ten-faced gongs and pitched gongs. Big Chinese gongs do not have definite pitches; they are able to produce varying pitches, as well as varying overtones (these depend on location and strength of strike). 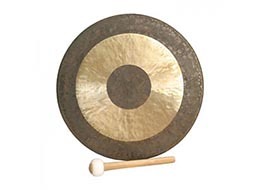 Regardless, consideration of a gong’s pitch is not something that takes precedence over sound quality of the gong. The small Chinese gong is much smaller than the big Chinese gong, and has a circular face in the center of the instrument. Spanning 15 cm in diameter (the face spans 4 cm), this gong is played with a wooden stick that is shaped like a plank. It usually adds a sense of humour to the music when needed, or is even used for characterization in operas. In orchestral works, the small Chinese gong is used alongside the big Chinese gong. The ten-faced gong, as it name suggests, comprises of a set of gongs placed on a stand. It is played by a musician with mallets while standing. Each individual gong has a different pitch, volume and timbre, and is hence difficult for composers to score for. The pitched gongs or yunluo, just like the ten-faced gong, consists of many small gongs that are affixed on a stand and played with mallets. As it is commonly referred to as a ten-faced gong in some areas, the names of the pitched gongs and ten-faced gongs have become interchangeably used. These pitched gongs, however, are typically smaller and possess tighter but brighter tonal colours. Once again, the lack of standardization would mean that there is a great number of different Chinese gongs available as yunluo. The instrument can be played at high speeds; hard-tipped mallets produce strong, clear sounds whereas yarn mallets produce less hard, yet resonant sounds. Want quality Gongs from a trusted source?